Attention Ghostbusters… This Halloween Season, wouldn’t you love to trap your very own ghost in a bottle? With this simple and inexpensive DIY (Do It Yourself) project, you can! If you have a recycling bin nearby, you have all of the makings for this fun and frugal DIY Ghost in a Bottle. Kids will love creating their very own ghost and trapping him in a bottle where they can make him do twists and turns all over the place. Take a look below at how to make your very own Ghost in Bottle, the perfect craft for the upcoming Halloween season! 1. First, you want to remove all of the label from your 2 liter soda bottle. Rinse it well. 2. Fill the bottle with water and add a few drops of orange food coloring. Or, you can add a drop or two of yellow and red to mix your own. Place the lid back on and shake so your color mixes well. 3. Turn your shopping bag over and cut off the end, about 3 inches worth. The “end” of the bag is the very bottom where your items would rest in the bag. When you cut off the end, you are basically creating a smaller bag. 4. Hold the new mini bag under the faucet and put a few drops of water in it. This will create the head. You don’t want to add so much that your head won’t fit in the bottle, so only add a small amount. The water will also act as a weight, allowing the ghost to fly around the bottle. So take your time and make sure you do this step just right. 5. Twist the bag to create the head and place a rubber band on the neck to secure it. 6. You can now use your marker and create a face! A few dots is all you need. 7. Using your scissors shred the bottom of the ghost to make it look nice and spooky. 8. Press the ghost head first into the bottle. Replace the lid and give it a good shake. That’s it! Your ghost will whirl and twirl all over the bottle in a spooky fashion your kids will love. The more they shake it, the more it will fly. 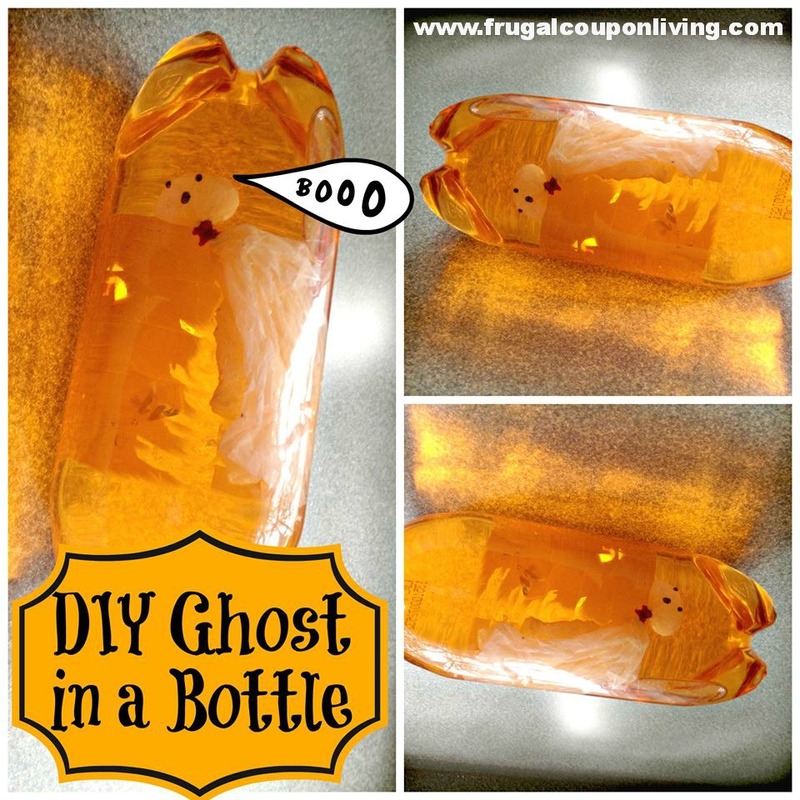 Give this Ghost in a Bottle craft a try and see how fun and easy it can be trap a ghost while using items you already have around your home. this is a fantastic idea very cute and easy. my kids loved it!! !